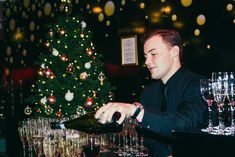 As the London summer sun starts to disappear for another year, you can count on Merlin Events to inject a bit of shine into your autumn months. Take a look at our 10 things to do in London this autumn! 1. BOBO Social is a brand new dining experience which will open in Fitzrovia this autumn. Every Monday, join a Head Chef for an experimental burger creation evening. Sip on cocktails and get your hands dirty creating burgers with a range of exotic and tasty meats. Try kangaroo, alligator, venison, ostrich and of course BOBO’s classic rare-breed beef. 2. Streaky Gin is a new concept bar derived from the minds of a cocktail enthused English gentlemen and an American girl with southern charm and a very healthy appetite. This British/American fusion concept packages the best of both worlds into one quaint little spot. Combined with a chilled vibe, fun atmosphere and music that encourages you to relax and unwind, it will be your home away from home. 3. VOGUE Fashion’s Night Out – Surrounding London’s fashion week VOGUE invites you join the elite on Old Bond Street this September with late night shopping and fabulous street entertainment. Why not grab a glass of champagne and make a few purchases to remember! 4. The iTunes Festival at Camden’s Roundhouse – this world famous event takes place throughout September every year. Download the Yplan app to register for your free tickets!! 5. ‘The Play That Goes Wrong’ – opening this autumn at the Duchess Theatre. This brilliant new laugh out loud comedy performed by Mischief Theatre Company has enjoyed two successful runs in the West End and was the sellout smash hit of the Edinburgh Festival with its sensational reviews, numerous accolades and awards. The Play That Goes Wrong is guaranteed to leave you aching with laughter! 6. SEALIFE After Dark – Pints or piranhas? Shiraz or sharks? 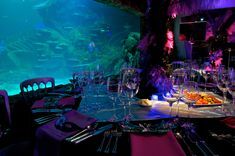 At London Aquarium’s SEA LIFE After Dark event you won’t have to choose, so dip beneath the surface for a VIP late opening on October 3rd. This event is perfect for catching up with friends or treating your partner to something special! 7. Get a wet shave in Mayfair – The metrosexual man may no longer have his own butler to attend to his barbering needs, but Geo F Trumper is here to help. Their Mayfair store on Curzon Street is a shrine to Victorian male pampering. Having a luxurious wet shave here is as relaxing as a massage. 8. Podium Dancers at Cyberdog in Camden – with a burst of colour and a space-age anti-retro philosophy, its three-floor flagship store in the Stables Market is as much a club space as a boutique. Its music pumping and wildly clad dancers gyrating on podiums really do inspire your spending. 9. WW1 commemorations: ceramic poppies at The Tower of London – 888,246 are being planted in the dry moat around the London landmark to remember each British and Colonial death during the conflict. The last poppy will be put into place on November 11th and then sold to the public. All proceeds will be given to charity. 10. Watch Lady Gaga Live on her artrave: The ARTPOP Ball tour which is supporting her number one album Artpop at The O2 on Thursday 23rd, Saturday 25th and Sunday 26th October. One of the world’s most popular artists, Lady Gaga has sold nearly four million concert tickets around the globe! 11. BRIEFS: The Second Coming. The group has been described as an Aussie Cirque du Soleil meets Ru Paul’s Drag Race. Get ready for a madcap safari through extravagant birdbath boylesque, too-close-for-comfort yo-yo tricks, valiant aerial acrobatics, irreverent interludes, ferocious fanfares and show-stopping drag artistes. 12. The Tall Ships Festival – Part of the Falmouth – Royal Greenwich Tall Ships Regatta, this festival in Greenwich runs from 5th – 9th September with a fantastic selection of events. Let us know if you manage to get around to doing any of the above – we would love to hear your comments!